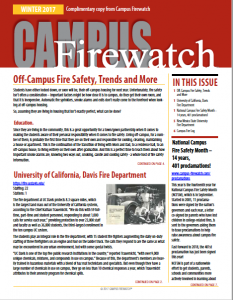 Campus Firewatch is the only newsletter in continuous publication since 2000 focusing on campus fire safety. Want to learn more? Download a complimentary copy of the Winter 2017 issue. Campus Firewatch has served to help campus and communities in their efforts to make students safer from fire. This electronic newsletter is delivered right to you by email four times a year and contains information that you just will not find any other place. So subscribe today! And, for piece of mind…I do not share, rent or sell your information to anyone else. Want to subscribe? Click on the “Buy Now” button and you are on your way!